Growth, renewal, and positivity have been themes as we begin a new academic year at CI. Just last week I attended sixth grade orientation, where the team of teachers were stressing the importance of helping students to steer away from the fixed mindset of being a “math person” or a “non-math person”. 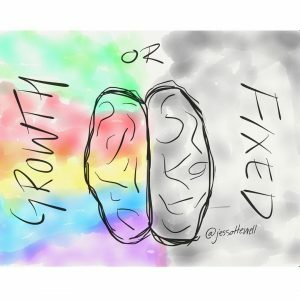 In the fourth grade classroom, the teacher referenced Carol Dweck from Stanford University, and her work on the benefits of the growth mindset for students. There seems to be a common thread of being open to new learning, open to change, and open to the idea that there are no limits to learning. Remaining open to new directions. Along the lines of this refreshing sense of openness, it seems appropriate to then connect back to openCI. 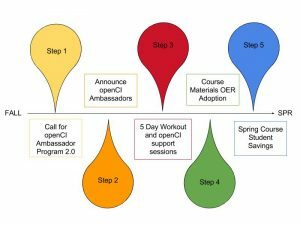 As some of you may already know, openCI is the name for the targeted CSU Affordable Learning Solutions (AL$) effort on the Channel Islands campus addressing textbook affordability for students. We are proud to report that efforts from the 2016-2017 Academic Year, students saved $259,151.80, affecting 2,053 students in 73 course sections. That is an average savings of $126.23 per student and $3,550.02 per course. This and another estimated $150,000 savings this fall is a reflection of the amazing work of the openCI Faculty Ambassadors at CI. So the big question then, is how can openCI remain open to new directions and grow? Due to the successes of openCI, we were able to secure additional funds from the Chancellor’s Office to develop a new effort to reduce the cost of textbooks program wide. The goals of this new effort is to support programs in reducing the textbook cost of their degree by at least 30%. Two programs (Communications and the School of Education) have committed to, and started plans for program-level textbook affordability approaches. The program-level approach creates a potential path for textbook cost reduction for courses in a specific major, potentially targeting courses with high enrollment or poor retention. By reducing cost barriers with course materials, these efforts hope to align with and support 2025 graduations rates related to time-to-graduation and academic success. We look forward to the outcomes from the amazing faculty in Communications and the School of Education working on these efforts. What open educational resources are you already using? What other open educational resources are available in your discipline? Be comfortable with the idea of growth, modeling not knowing all the answers, and responding “I don’t know” to students as Phil Hampton encouraged last week. We can continue to support a growth mindset allowing learners to grow, engage, and explore without fear of failure, but rather excitement for the experience of engaging in the process of learning.